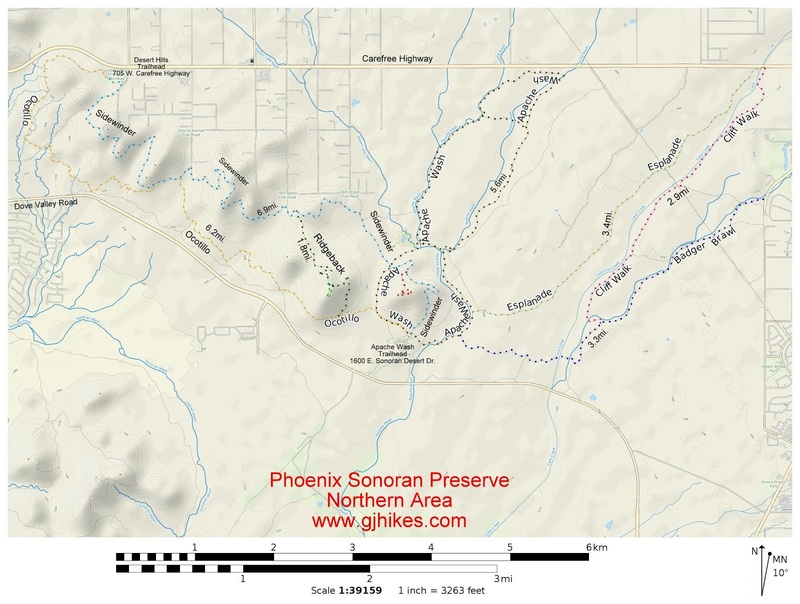 The Ridgeback trail is located in the northern section of the Sonoran Preserve in Phoenix, Arizona. Beginning off of the Ocotillo trail Ridgeback climbs at a moderate angle up the side of the mountain before descending into the valley on the north side of the ridge and coming to an end when it meets up with the Sidewinder trail. There is an option to climb all the way to the top of the mountain via the Ridgeback Overlook trail along the way where your extra bit of effort will be rewarded with some great views of the area. 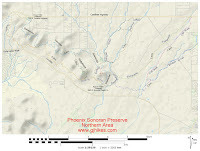 This post begins at the Apache Wash trailhead at 1600 E. Sonoran Drive. From the parking area take the left fork and follow the Ocotillo trail. As the Ocotillo trail heads westward the Ridgeback trail can be seen travelling along the side of the mountain up ahead. 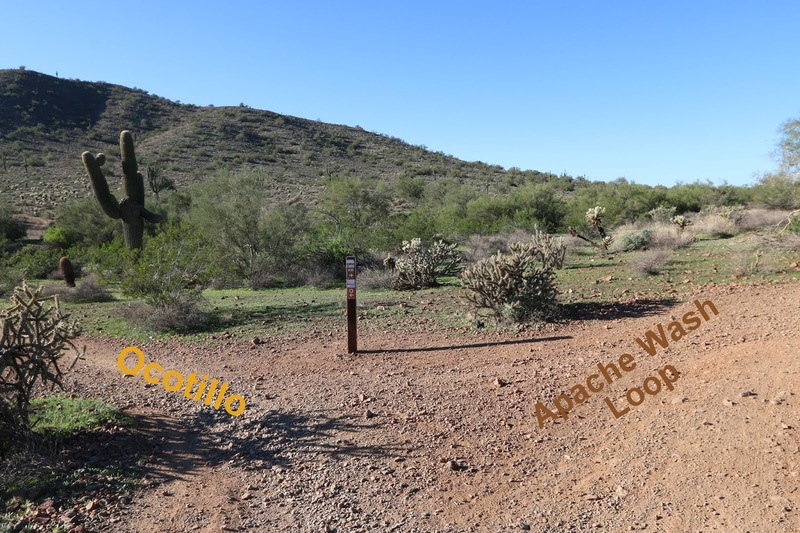 Stay left at the 0.3 mile point from the trailhead where the Ocotillo trail is joined by the Apache Wash Loop. The Apache Wash Loop is a good option for the return trip. 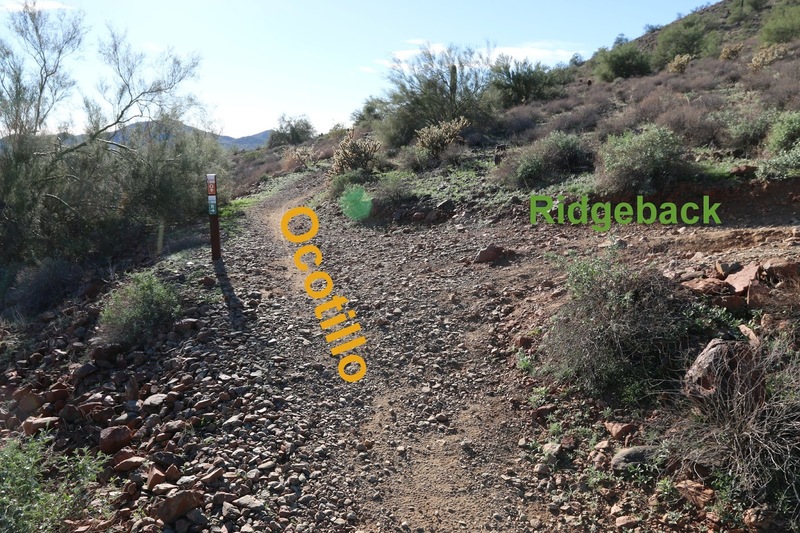 At the 0.7 mile point the Ocotillo trail comes to the spot where the Ridgeback trail branches off on the right. The Ridgeback trail climbs at a moderate rate as it works its way up and around the side of the mountain. There are a couple of switchbacks along the way to make the climb a little easier. At the half mile point of the Ridgeback trail the Ridgeback Overlook trail takes off on the left while the Ridgeback trail makes a sharp turn to the right and levels off somewhat. The Ridgeback Overlook trail is only a quarter mile long. It will add a little more elevation gain but it is a nice alternate route. 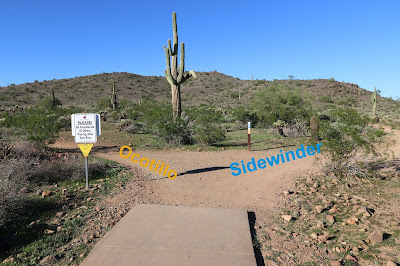 The Ridgeback Overlook reconnects to the main trail just over 250 feet from where it began. 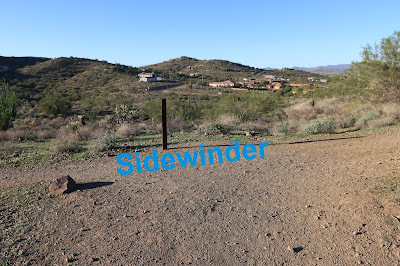 When we took the photos for this post we actually stayed on the Ridgeback trail up to this point and then went to the left and picked up the Ridgeback Overlook and looped back around to this spot before continuing. After one more little hump the Ridgeback trail begins working on its descent down the other side of the mountain making use of a few more switchbacks in the process. The descent eases up quite a bit as the trail gets into its last half mile. Ridgeback comes to an end as it meets up with the Sidewinder trail. 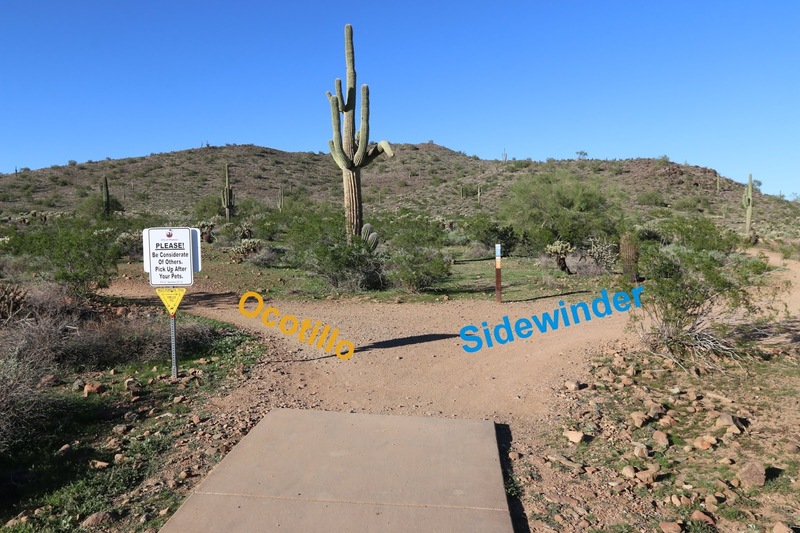 From here you can go to the right and return to the trailhead via the Sidewinder trail after another 2.4 miles, for a total round trip distance of 4.6 miles, or you can follow the Sidewinder trail for 1.2 miles and then take the Apache Wash Loop to the right for a total distance of 1.9 miles to the trailhead and a round trip distance of just over 4 miles. There are a lot of options depending upon how much time and energy a person has. While all the trails are well marked a map can still come in handy for planning your route. If you would like to see it for yourself then all you have to do is 'Take a hike'.